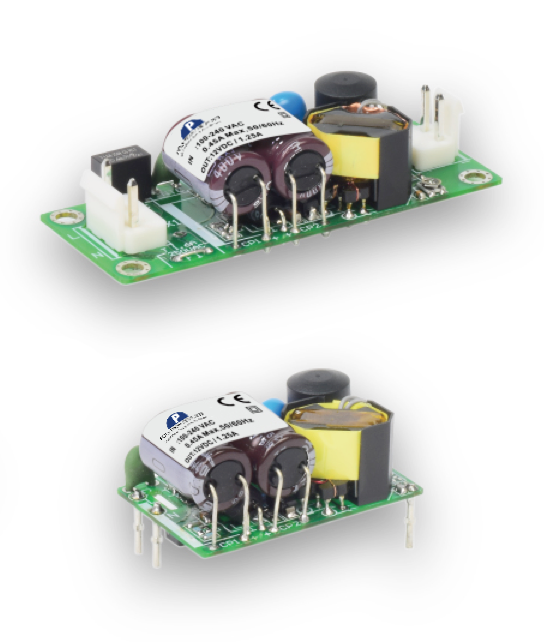 Our switching power supplies include universal input capability and a variety of output options, as well as high-performance EMI input filters. Encapsulated models are available, as well as enclosed open frame, Din Rail, PC card, or chassis mount with screw terminals. 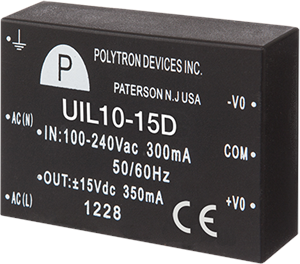 With more than half a century of power-supply experience, Daburn guarantees the Polytron Devices line of high-quality power modules, all of which meet UL’s strict safety standards. We offer many power modules designed specifically for medical applications. 5 Watt Universal Input - Single and dual output; short-circuit protection; overload protection; efficiency of up to 80 per cent. 5 Watt Universal Input, Extra Small Package - Measures only 1″ by 1″ and encapsulated in a plastic case. Up to 85 per cent efficiency; short-circuit, overload, and overvoltage protection in applications up to 5 Watts. 7 Watt Universal Input - Internal input filter; short-circuit, overload, and overvoltage protection. 10 Watt Universal Input - Internal input filter; short-circuit, overload, and overvoltage protection. 10 Watt Universal Input, Extra Small Profile Package - Universal input of 90-264 Vac; short-circuit, overload, and overvoltage protection. 15 Watt Universal Input - Up to 85 per cent efficiency; universal input of 90-264 Vac; short-circuit, overload, and overvoltage protection. 15 Watt Universal Input, Adjustable Output Range - Internal EN55022 Class B filter; 3,000 Vac reinforced insulation; operating altitude of 5,000 metres. 15 to 24 Watt Universal Input for Medical Applications - Interchangeable plug; short-circuit and overvoltage protection. 25 Watt Universal Input - Up to 85 per cent efficiency; internal input filter; short-circuit, overload, and overvoltage protection. 30 Watt Universal Input - Up to 88 per cent efficiency; universal input of 90-264 Vac. 40 Watt Universal Input - Recommended for industrial applications. Single adjustable output voltage. 40 Watt Universal Input for Medical Applications - Up to 90 per cent efficiency. UL 60601-1, 2 X MOPP. 65 Watt Universal Input - Recommended for industrial applications. Single adjustable output voltage. 65 Watt Universal Input For Medical Applications - Up to 92 per cent efficiency; operating altitude of 5,000 metres. UL 60601-1, 2 X MOPP. 100 Watt Universal Input For Medical Applications - Active power-factor correction; built-in EMI Class A filter; low leakage current. UL 60601-1, 2 X MOPP. 100 Watt Universal Input For Industrial Applications - Up to 92 per cent efficiency; low standby power for energy savings. 130 Watt Universal Input for Medical Applications - Short-circuit, overload, and overvoltage protection. UL 60601-1. 150 Watt Universal Input For Medical Applications - Up to 92 per cent efficiency. UL 60601-1, 2 X MOPP. 150 Watt Universal Input For Industrial Applications - Up to 92 per cent efficiency. 230-310 Watt Universal Input For Medical Applications - LED indication; overvoltage, overcurrent, over-temperature, and short-circuit protection. UL 60601-1, 2 X MOPP. 310 Watt Universal Input For Medical Applications - Class I and II protection; up to 87.5 per cent efficiency. 450 Watt Universal Input - Low leakage current; operating altitude of 5,000 metres. 450 Watt Universal Input For Medical Applications - Low leakage current; operating altitude of 5,000 metres. UL 60601-1.